At Harestock Primary we have children and families from all over the UK and world. About 20% of our pupils have parents or carers who are in the armed forces, and we have both Forces Families and civilian families joining us throughout the year. We welcome the broad range of experiences all our families bring to the school and value the many contributions to our school life and community. If you might be joining us at Harestock then have a look at ‘Our school day’ under the ‘About’ tab for more information. If you have any questions, or would like to arrange a tour of the school or (if you are too far from the school to come and visit) to speak by phone to the headteacher, then please give us a call or use the “contact us” page to drop us an email. You can find out more about the Winchester Garrison by contacting the Winchester Garrison HIVE. The HIVE Information Centres are provided by the Army, Royal Navy and RAF to provide information and support to all members of the Service community. What days are pupils at school? Pupils need to be at school during term time. The term dates can be found on the Hampshire County Council website here. The school is closed for teacher training on “inset days” and we let parents know these at the start of each year. If you are starting after the first week of September then please ask the office for a copy of the school calendar, or a copy of it can be found here. In extreme weather, or in the event of an emergency, the school may be closed at short notice. If this happens we will use the contact details we hold on our system to contact you. We would also hope to be able to put information up on this website. Classes are taught in English but if a child’s first language is not English we arrange for an interpreter to be present with the child for the first lessons. We also have a “young interpreters” scheme in which some of our pupils have become accredited interpreters and so can help other pupils settle in. If your child has any special educational needs then please let us know as soon as possible so that we can assess those needs and put in place a suitable programme of support. There is more information on how we look after children with special educational needs on the ” About” section of this website. What do children wear at Harestock Primary? We have a uniform – the jumper is royal blue and has our school logo on it. The rest of what we wear is grey trousers or skirt and a white “polo” style t-shirt. We can wear socks or tights, the preferred colour is white, cream, black, grey or blue, with black shoes of any sensible and appropriate style. For physical education we wear blue shorts and a white t-shirt with the Harestock logo on it and trainers or plimsolls. You can also wear Harestock fleeces or caps if you want to. The school jumper can be bought from the school office any time during school hours, and the trousers, skirt, t-shirts, socks, tights and shoes can be bought from the standard school uniform range in shops such as Marks & Spencers, Tesco, Sainsburys and Asda. All infant children (Yr – Y2) are entitled to a universal school meal – for a list of lunches available, please click here. For junior school children (Y3 – Y6) the cost is £2.20 per meal, payable in advance. We operate a healthy school ethos towards packed lunches and would ask that contents are healthy and appropriate for your child’s dietary needs. What will happen before and on my first day and in my first month at Harestock? Before a pupil’s first day at school we hope that there will be an opportunity for us to show the family around the school and introduce the teachers who will be teaching the pupil. If the timing of your move means that this is not possible then please let us know so that we can arrange for the family to make contact with the teacher another way – for example by a phone call or perhaps email. Before the first day we will arrange with you whether to bring your child straight to the classroom, or to the school office. We will make sure that the new pupil is introduced to classmates and assigned a “buddy”. We have “school-home” diaries in the juniors which we use to communicate non-urgent messages. You are also very welcome to arrange a time to speak in more detail with your child’s teacher – to make an appointment please call the office. If your child has any concerns or questions during the school day then they can ask their teacher or, if they prefer, speak with one of our staff in the office or a lunchtime supervisor and they will help. What “kit” will I need? We believe that parent-teacher-pupil communication is essential. Teachers are available immediately after school for ten minutes on the playground (not Tuesday’s), or you can make an appointment for a particular day and time through the office staff. We have two “parent-teacher” evenings each year, and an “open school” afternoon and evening where parents can come in with their children and spend time in the classroom and looking through the child’s books and work with the child. If you need to let your child’s teacher know something important about the child at the start of the day (such as they are being picked up early or going home with a friend or grandparent) then please pass that information to the office, or through a note attached to the front of the book bag or (in the case of juniors) to be handed in by the child. If one of the child’s carers is going to be deployed or away please let the teacher know because sometimes this can affect children when they are at school. It also helps us to support the child and understand any questions that they might have about the news or particular countries or events. We also use notes in childrens’ book bags or “school-home” diaries or homework diaries to communicate with parents, as well as an email system called “Parent Mail”. If you would like to receive notices by Parent Mail then please let the office know. It is also useful if we can have your mobile number so that we can let you know about things such as school closures in the event of heavy snow. If you have any questions, or would just like to talk through the things you have read on this website, then please contact our office. 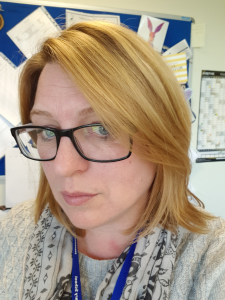 To introduce myself, my name is Celia Bailey and I am part of the Inclusion Team at Harestock. As part of that role I oversee the transition both in and out of school for any service child arriving or leaving Harestock. As a trained ELSA I am also qualified to help the children to understand and deal with the emotional issues that can come with being part of a Service Family. Life can sometimes be a challenge! Unfortunately, we can’t change that but what we can do is learn how to deal with the challenges in a positive way. One of my roles is to work closely with children and families who may be experiencing difficulties. This could be as simple as a misunderstanding with friends or it could be a more complex issue such as bereavement, a change in family circumstance or, for our Service personnel, deployment overseas or a long tour away from home. It may be that the support is needed for a short while or it could be a longer process. In our school hall we have a ‘Home and Away’ board. Each Service child has their photo on the ‘Home’ circle and we encourage parents or carers to come into school with their child and move the picture to the ‘Away’ side should a family member be deployed for any length of time that may affect the child. For younger children this may be a week, and for older children this may be longer. If you are unable to come into school and do this with your child, we are more than happy to do so on your behalf. It is a very quiet way of letting all the members of staff who may come into contact with the child know that they may be feeling a little vulnerable and may need some extra support. When the deployed carer returns, the picture is moved back to the ‘Home’ board and we can celebrate their return. At Harestock the emotional welfare of our pupils is of the greatest importance and my role enables these issues to be given the time and care needed to be sensitively and compassionately worked through together. We seek to break down the barriers to learning so that all children can be successful and make good progress. Ensuring good attendance is vital to your child’s learning, it is also your legal responsibility to bring your child to school and keeping them off school without good reason is an offence in law. Another part of my role is to monitor absences and lateness across the school and act accordingly. This is done by contacting parents/carers if attendance drops below 90% without reasonable explanation and then working together to improve the attendance or lateness. I look forward to meeting you all and forging some strong home school links with Harestock Primary School. This is by no means an exhaustive list; there are many other support networks on the internet for Forces Families.